Last night was Math Night at my school, and although I wasn’t on the committee I wanted to do something in the library to show my support. 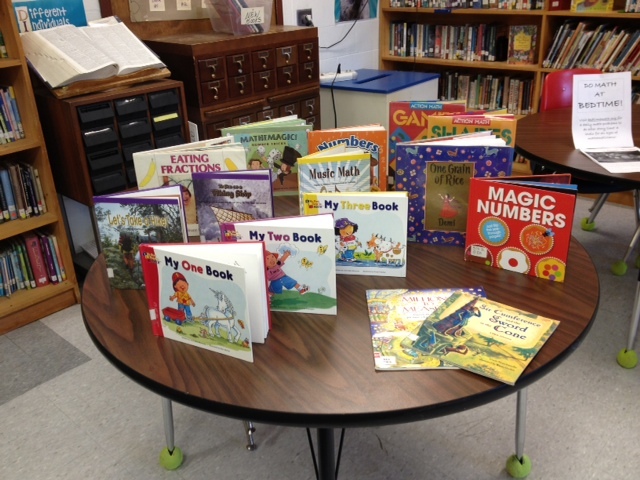 Of course, I chose a book display! On another table I provided a print out of this list so that parents could go to their local library if they chose and check some of them out. 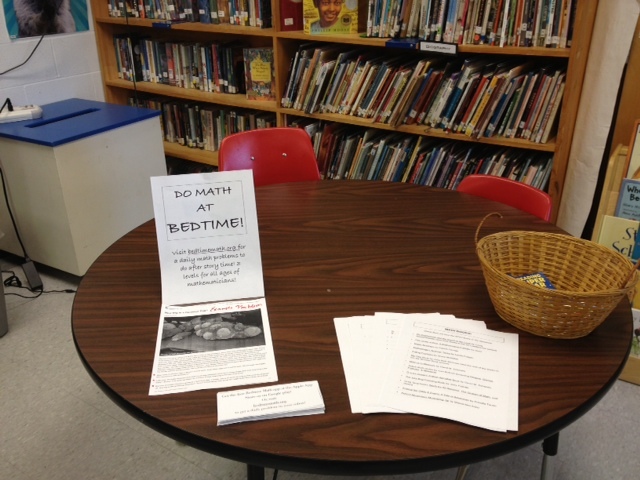 On the same table I provided information about Bedtime Math, an organization that posts a math problem on their website daily (they also have an app!) The best part about their problems is that while the set-up and background information is the same, there are three to four different questions that can be answered that are tiered–one is for beginning mathematicians, and the rest get increasingly more difficult. They also have a great afterschool program kit (for free!) called the Crazy 8s Club. I provided some small sheets with website information so that parents could do the daily problem at home! 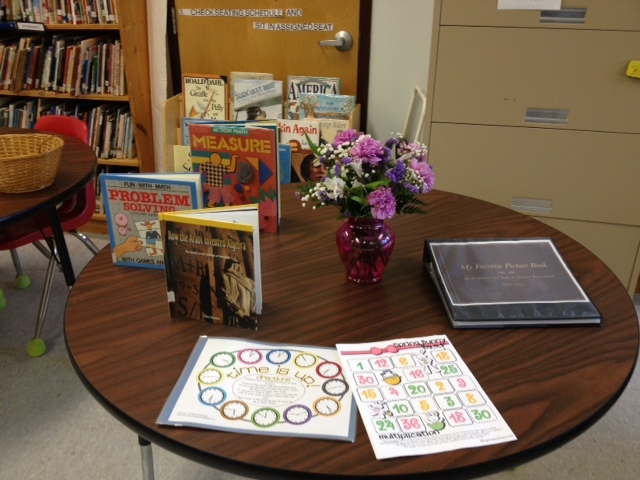 You can also have a table with some fun math games to play when people stop in. 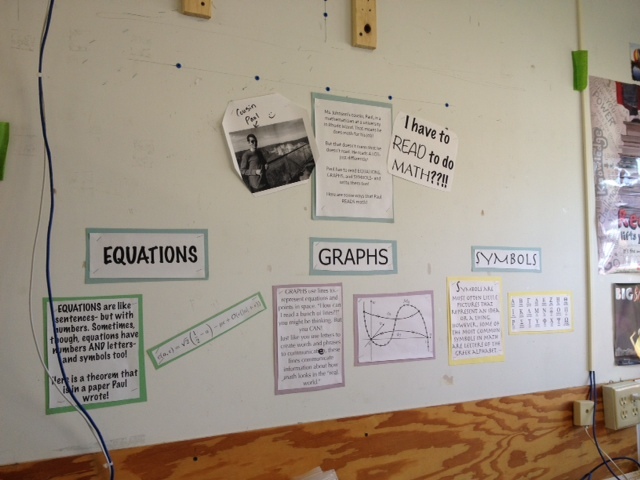 I have the special circumstance of having a cousin who is a mathematician, so I was able to create a wall display about him, his work, and how much reading there is in math! I focused on equations, graphs, and symbols, and how they each convey information that needs to be “read”, just like a book or a magazine! The equation and graph example are actually from a paper that my cousin has had published! It is easy to make connections across the curriculum and make it fun too!